Forgotten Hollywood » Blog Archive » “Forgotten Hollywood”- Surviving Andrews Sister Has Died! “Forgotten Hollywood”- Surviving Andrews Sister Has Died! Throughout their long career, the sibling team sold well over 75 million records. When they burst upon the music scene in the late 1930s, it shook a very solid musical foundation. They produced a slick harmonic blend, singing at the top of their lungs, while trying – successfully – to emulate the blare of three harmonizing trumpets, with a full big-band playing in concert. The girls were a tour de force. Born in Minnesota, the sisters began touring in vaudeville with Ted Mack. By 1937, Sammy Cahn was writing lyrics for them, and a first big radio hit was Bei Mir Bist Du Schon. Universal Pictures signed the trio on the suggestion of the Ritz Brothers. Maxene, Patty, and Laverne appeared in seventeen motion pictures, including Buck Privates with Abbott and Costello. Their hits included Chatanooga Choo Choo, Three Little Sisters, Boogie Woogie Bugle Boy of Company B, and Don’t Sit Under the Apple Tree. During World War II, the girls entertained the Allied forces, extensively visiting Army, Navy, Marine and Coast Guard bases, war zones, hospitals, and munitions factories. They encouraged our citizenry to purchase war bonds. They also helped Bette Davis and John Garfield create the famous Hollywood Canteen. 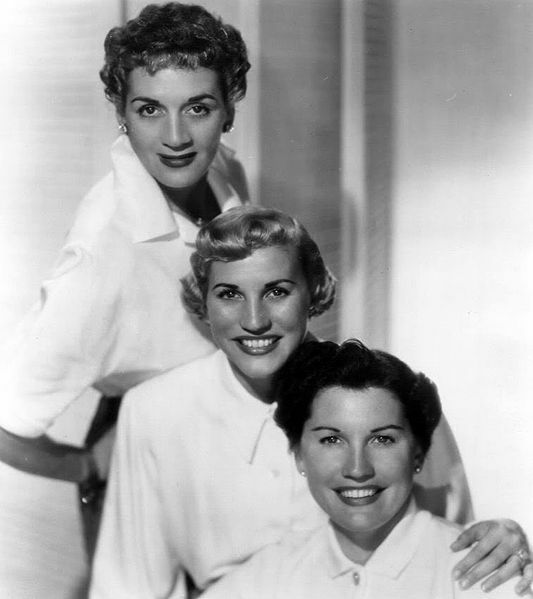 The Andrews Sisters became the best-selling female vocal group in pop music history, setting records that remain unsurpassed to this day. Only, the Supremes even come close. Their songs and harmonies are still influential, and they have spirited fine entertainers as Bette Midler and Christina Aguilera. After the death of Laverne in 1967, Patty embarked on a solo career. Maxene died in 1995. 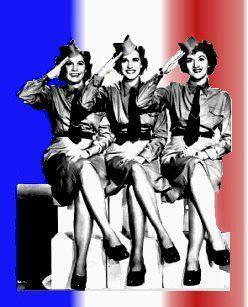 The Andrews Sisters remain as big in music sales as Elvis and the Beatles. This entry was posted on Thursday, January 31st, 2013 at 12:33 am	and is filed under Blog by Manny Pacheco. You can follow any comments to this post through the RSS 2.0 feed. Responses are currently closed, but you can trackback from your own site.